Next time you want to give a gift card to someone as a birthday present but feel guilty doing so, you should instead, grab one of these puzzle vaults. 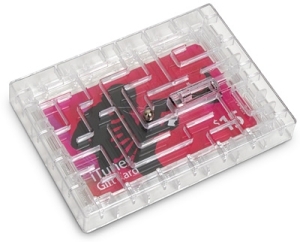 The puzzle vault is a contraption that you slide a gift card in to and the only way the receiver can get the gift card out is by rolling a ball bearing around a maze to the end so that the door can be opened. The maze is clear plastic allowing the gift receiver to see the present inside. By adding a simple maze game around the gift card it somehow makes it all ok and gives the sender a guiltless feeling that he couldn’t enjoy before. Available from ThinkGeek costing $4.99.